The Greater Sydney Commission (GSC) was formed by the State Government in 2015, as an independent body, tasked with the job of coordinating and aligning the planning that will shape the future of Greater Sydney. This week, they released their vision for Sydney’s future, which is on public comment until the 15th of December. Their vision is in the form of a Regional plan, which covers the Sydney metropolitan area as well as five district plans, covering different areas of Sydney. 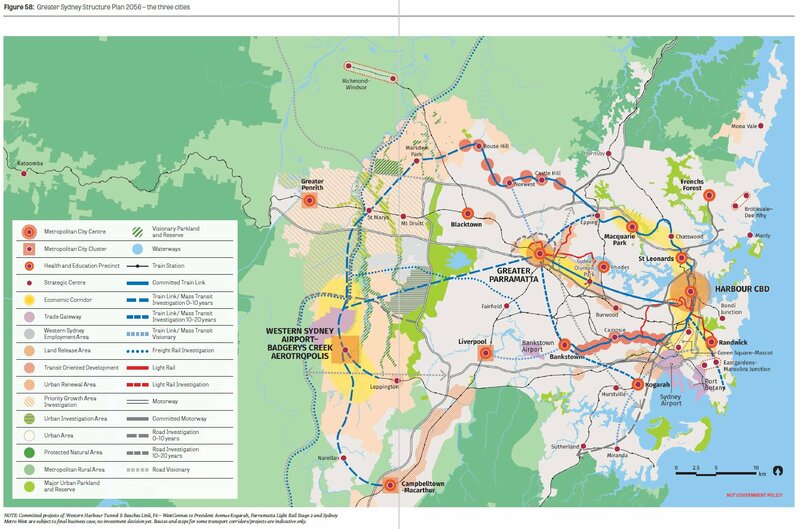 At the same time, Transport for NSW released their draft Future Transport strategy which looks at how Sydney will be shaped by public transport and roads over the next 40 years, which is on public comment until December 3. These plans are important as they will shape Sydney’s growth into the future. The region will be home to about 1.6 million more people over the next 20 years. The map below summarises the vision outlined in these plans.